In the last leadership race, I profiled the, what was it, fifty or sixty candidates. So, to kick off this leadership convention coverage, I present the first in a one part series of leadership candidate profiles - Michael Ignatieff. "It's good for people to believe in causes larger than themselves." Background: Ignatieff was born May 12th, 1947, in Toronto. He attended U of T where his days were spent studying ethnic nationalism, and his nights were spent berating his roomate over mistakes he'd made years ago ("leaving the milk out overnight last fall was a war crime"). After a brief teaching stint at UBC, he went off to Cambridge, before settling down at Harvard. During this time, he established himself as a world-famous academic, and one of the "100 smartest people alive". But if you haven't read his writings or seen him on TV, don't worry - the highlights will soon be coming to an attack ad near you. Since Then: Ignatieff proved himself to be a strong performer in parliament, and has managed to grow as a politician during the last three years. The gaffes are fewer, farther between, and less damaging than when he first entered politics. 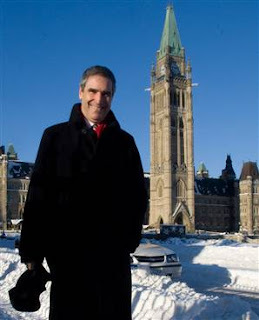 Ignatieff has been able to portray himself first as a "leader in waiting", and now as a "Prime Minister in waiting". The "Race" for Stornoway Sussex Stornoway II: More understandably, Ignatieff started this race as the front-runner. His competition was Bob Rae (who had the misfortune of leading Ontario through the last recession, and the greater misfortune of running for leadership during this one) and Dominic LeBlanc (who you may have heard of if you are related to Dominic LeBlanc). Once the puffin turds hit the fan in December, Liberals decided they couldn't go on for another five months with an academic leader who proposed carbon taxes and mused about tax hikes...so they did away with the unpleasantness of voting and handed the keys to Iggy. Criticism: The big knock on Ignatieff was that he supported the war in Iraq. So he wrote a lengthy New York Times mea culpa in 2007. A lot of people also didn't like the fact that Ignatieff had lived outside of Canada for most of his adult life. So he wrote a book about Canadian patriotism. Some have also said he comes across as an out-of-touch academic but, rest assured, I have it on good authority that Ignatieff is currently writing a 50 page dissertation with the working title "Michael Ignatieff can relate to the proletariat". My Take: I'll always be a bit uncomfortable with the amount of time he's spent out of the country, and the two of us will never agree on the Quebec nation thing. But Ignatieff has the potential for greatness unlike few others, so I can certainly understand the appeal. And with 3 more years in politics - and in Canada - he'll make a better leader today than he would have three years ago. So I'm willing to knock on doors for the guy and I do hope he wins the next election. An Ignatieff Prime Ministership would be fun to watch, since he strikes me as the sort who wouldn't want to waste it - he'd be bold, and he might even be able to inspire. So far, he's done a good job as (interim!) leader, but much of that has been by default. He has yet to clearly define his vision of the country, fight a campaign as leader, face attack ads, or deal with a hostile press corps. So it's still too early to predict how he'll fare as leader. But, like I said, so far, so good. Chance of Victory: I've re-run my leadership projection formula from 2006, and I can now project, with 95% confidence, that Michael Ignatieff will win the Liberal leadership race, most likely on the first ballot. posted by calgarygrit at 8:32 a.m. So "good leaders" don't take stands and don't oppose Harper on any votes in Parliament? I mean, his bench has risen less than Dion's - perhaps he just has better spin doctors. By Ian, at 8:56 a.m. The LPC is ahead in Quebec? By JimTan, at 10:50 a.m.
"So "good leaders" don't take stands and don't oppose Harper on any votes in Parliament? I mean, his bench has risen less than Dion's - perhaps he just has better spin doctors." The best leaders pick their battles carefully because they re thinking about the bigger picture. If one more year of Harper buys Iggy 10 years of Liberal hegemony, it is in his interest to cave. By hosertohoosier, at 7:54 p.m.
By Anonymous, at 12:35 p.m.
By I LOVE YOU, at 2:29 a.m.
i like all your post! By Data Recovery Software, at 8:39 a.m.
By elkamaal elkamaal., at 7:35 p.m.
By elkamaal elkamaal., at 8:26 p.m.
By elkamaal elkamaal., at 8:34 p.m.
By elkamaal elkamaal., at 8:39 p.m.
By elkamaal elkamaal., at 8:41 p.m.
By elkamaal elkamaal., at 8:46 p.m.
By elkamaal elkamaal., at 8:48 p.m.
By elkamaal elkamaal., at 9:04 p.m.